Ideally located on the Waterside of the City - just 10 minutes drive from the City of Derry airport and 5 minutes drive from the city centre. 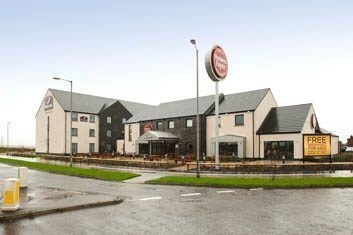 The hotel is an ideal base for the Crescent Link Retail Park - 5 minutes walk away. Our Derry/Londonderry Premier Inn has everything you'd expect, incredibly comfy beds in every room and the Brewers Fayre serving pub food as it should be, along with the all you can eat Premier breakfast. From Belfast: M2/M22 then follow the A6 over the Glenshane pass through Dungiven and into Drumahoe on the outskirts of the city. Take the 3rd exit at the Altnagelvin roundabout onto Crescent Link. Follow Crescent Link for approx 1 mile and turn right at the next roundabout. From City of Derry Airport, take Anfield Road and turn right onto Clooney Road. After 0.7 miles turn left at McLean Road and at the roundabout take the 3rd exit onto A2. Follow the A2 to the Caw roundabout and take the first exit onto Crescent Link. Follow Crescent Link straight through the Crescent Link roundabout. At the next roundabout take the first exit. The Premier Inn is on your right.